Da ist er nun, der erste Vierzylinder von Aprilia! Als V4 und mit einer Leistung von mehr als 210 PS in der Superbikeausführung! 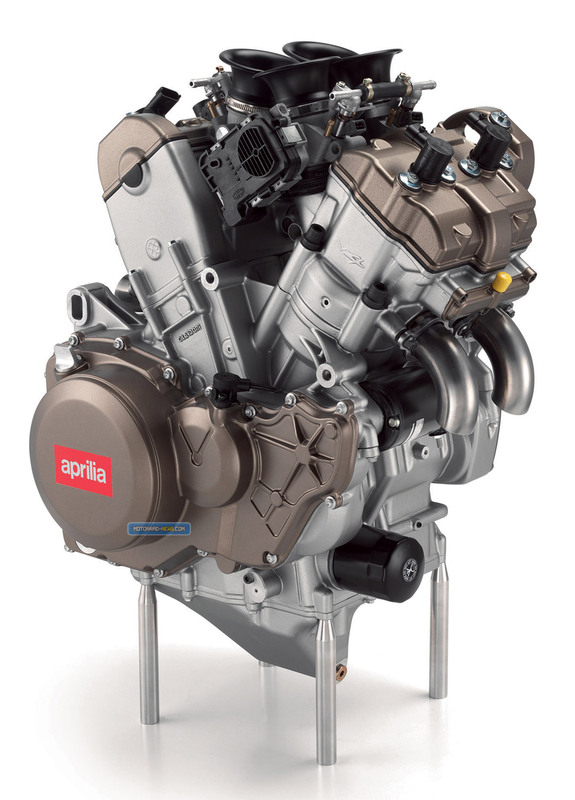 AN AMBITIOUS AND TECHNICALLY ADVANCED PROJECT, APRILIA’S FIRST EVER FOUR CYLINDER, IS READY TO BECOME THE NEW REFERENCE POINT FOR SUPERBIKE ENGINES WITH MORE THEN 210 CV IN SUPERBIKE CONFIGURATION . THE FUTURE IS ALREADY HERE IN THE FORM OF A NARROW V FOUR PACKED WITH PACE-SETTING TECHNOLOGY.Aprilia’s passion for racing has deep roots. Ever since Aprilia began, competition, and the opportunity for direct comparison that it affords has always been viewed as a vehicle for promotion and as a way to improve production bike technology. In this context, championships reserved for production-derived motorcycles are the most important of all race series for advancing the technology seen on standard road-going motorcycles. Competitive racing is the engine that drives Aprilia’s technicians and designers in a world where Aprilia is determined to remain at the top. This is the background to the development of the most revolutionary and powerful engine (more then 210 Cv in racing configuration) ever built by Aprilia. 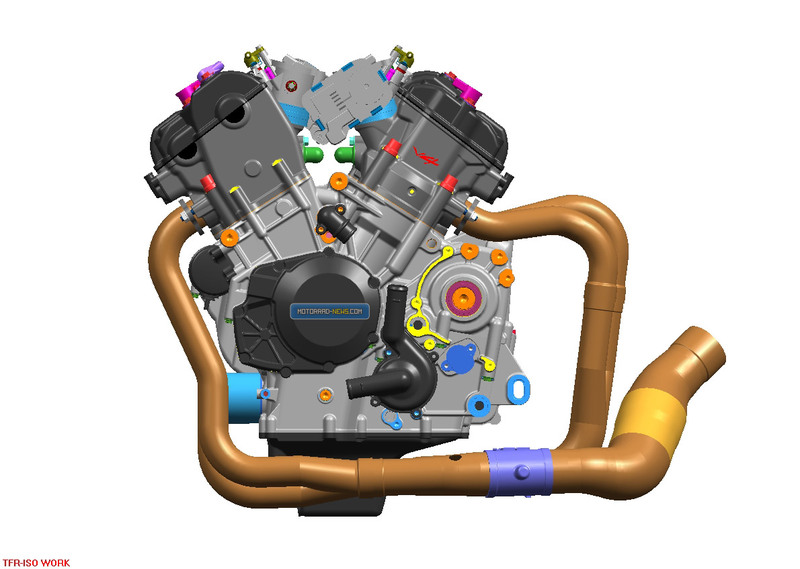 The new four cylinder powerplant is destined for use in Superbikes in the immediate future. 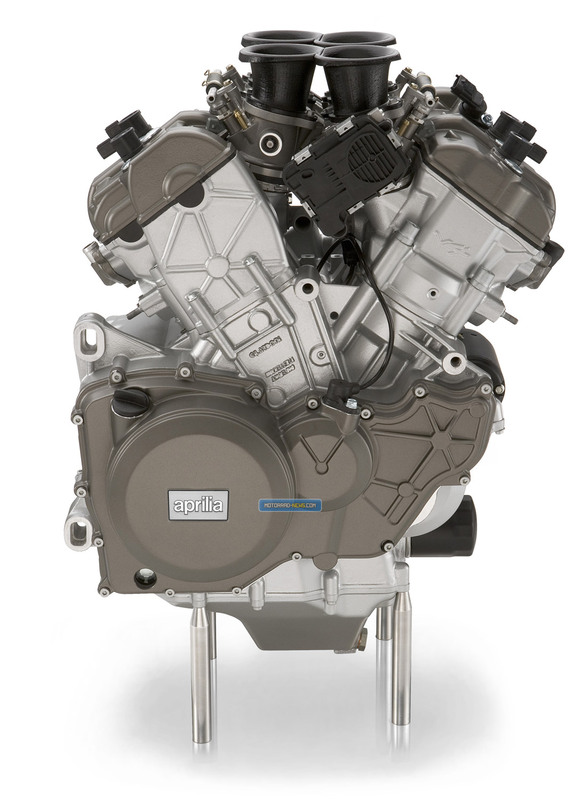 In it, advanced engine technology combines with prestige materials to deliver the best performance that present day motorcycle chassis design can handle.The project has been completed entirely in-house, in one of the most modern R&D departments in Europe, to guarantee record-breaking performance and power control. Just a few months of rapid development have taken the project from the general layout stage to the assembly of the first prototypes and engine start-up for initial bench testing. APRILIA’S FIRST FOUR CYLINDER Innovative solutions, advanced materials, and pure racing technology are the very DNA of Aprilia’s new Race Machine engine. It’s unusual layout makes it unique among the world’s production engines. 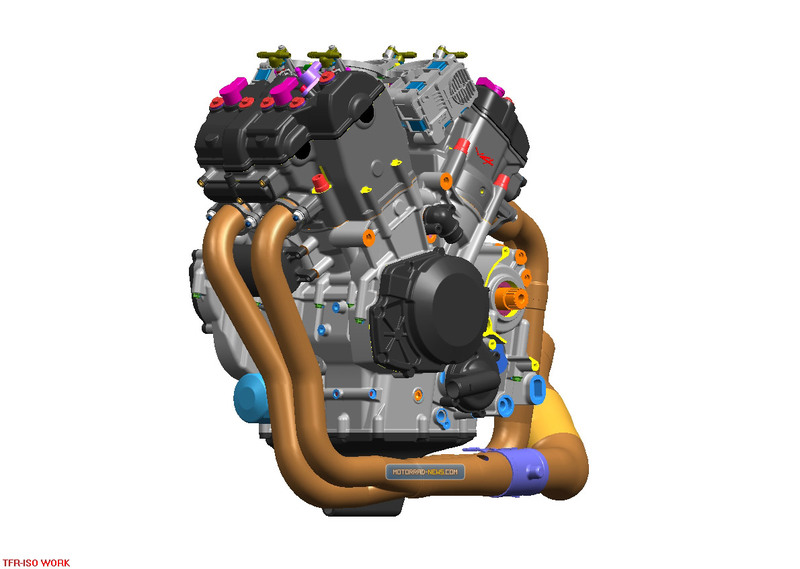 Aprilia’s extensive know-how in chassis development for narrow V engines must certainly not be wasted. 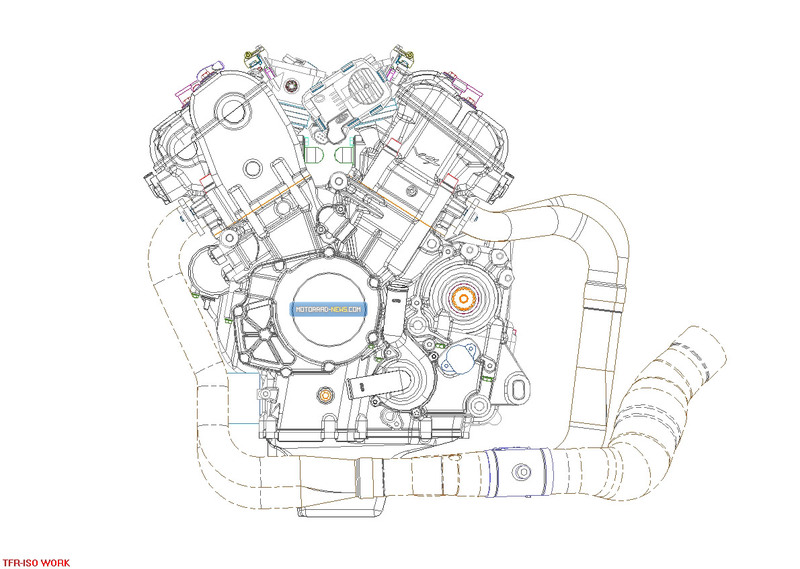 That is why, after so many tests and simulations, 65° was chosen as the ideal V angle for the new four cylinder. Because this angle is almost identical to that currently used by Aprilia for its V twins, Aprilia will be able to make full use of its tremendous wealth of experience in chassis design. By choosing a V angle slightly greater than 60°, the design team had enough space to optimise the path of the inlet tracts in order to maximise engine efficiency. The Aprilia Race Machine boasts more efficient fluid dynamics than any other narrow V engine. 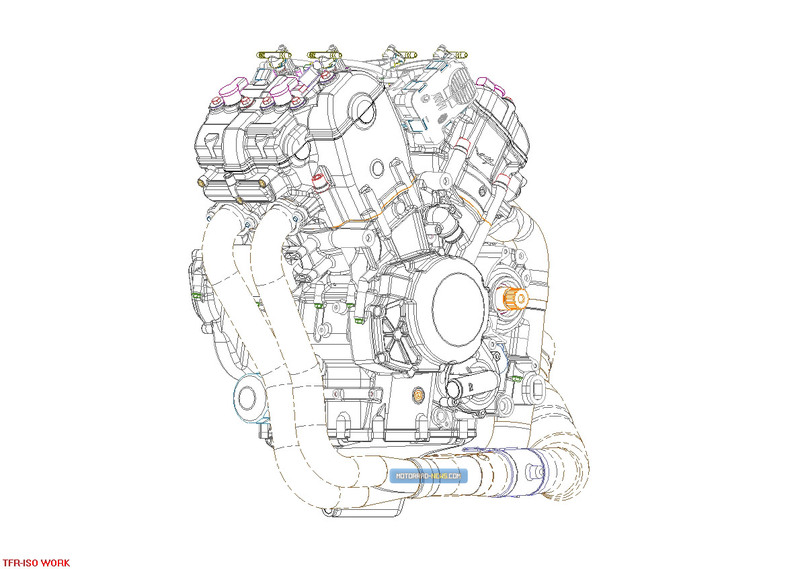 The Race Machine design team used the most powerful calculation software currently available to rationalise engine layout. The valve gear is driven by an original system that allows incredibly compact cylinder heads to be used. A lateral cam chain, driving only the inlet cam, follows the ideal drive path for precision valve timing and extended chain life. A pair of gears in the centre of the cylinder row re-transmits drive to the exhaust cam. This solution has enabled Aprilia to develop a cylinder head that is amazingly compact in the exhaust area. Incredibly, the Race Machine is even more compact than the V60 Magnesium currently installed in the RSV. A balancer shaft reduces primary vibration to a level inferior to that of a 90 degree V.
The cylinders are housed in a monoblock casting with integrated liners for maximum rigidity and constant efficiency. All this advanced mechanical design is obviously complemented by futuristic electronics. The Aprilia Race Machine uses ride-by-wire technology with a wiring layout never previously seen on any motorcycle. For example, there is no direct connection between the throttle grip and the throttle butterflies. Butterfly action is controlled entirely by a Marelli engine management unit of the latest generation. Each row of cylinders has a dedicated servomotor that operates only its own throttle bodies. The opening of the four butterflies and consequently the amount of fuel aspirated can therefore be controlled independently for each row. This advanced solution opens up new horizons in high power engine management, providing almost infinite flexibility in the control of power output under all possible riding conditions. Even real traction control has become possible. After all, such a powerful engine deserves only the best management. 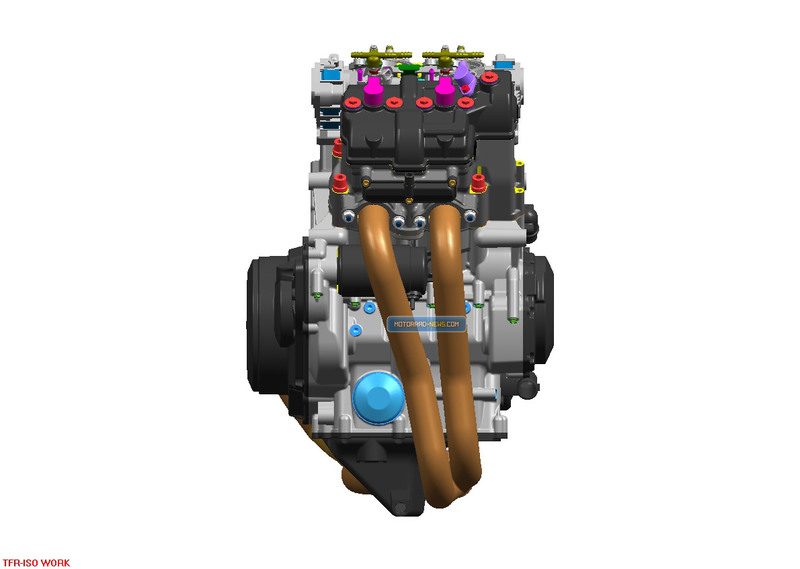 The fuel system uses two injectors per cylinder, one downstream of the throttle butterfly and one spray injector in the airbox that switches in under high load and high speed conditions. Even the transmission has been designed using the most advanced criteria to ensure maximum performance. The Race Machine racing origins are clear from its cassette gearbox, wet sump, and wet slipper clutch. 65 Grad beträgt der Winkel zwischen den Zylindern, was von Aprilia als idealer Wert ermittelt wurde. Der Motor konnte so insgesamt sehr kurz in der Länge gehalten werden. Dabei dreht er auch noch 13.500 U/min-1 (angemerkt: es ist kein 600er Vierzylinder). 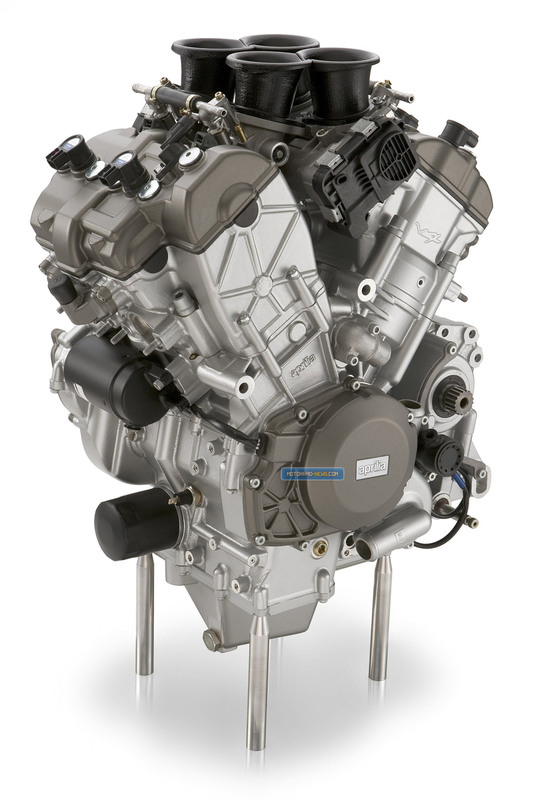 Power: more then 210 CV in Superbike configuration. Valve gear: 4 valves per cylinder (titanium and Nymonic) operated directly by camshafts driven by a mixed chain/gear drive, with lateral chain and central gears. 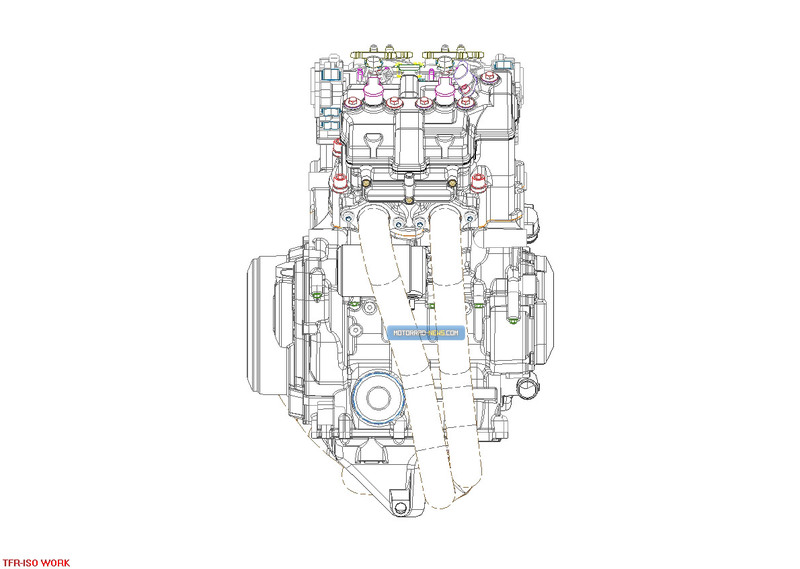 Fuel system: electronic fuel injection with two injectors and independent ride-by-wire control for each row of cylinders. Electronics: Magneti Marelli ECU for ignition, injection and ride-by-wire management.